A GLUE IF YOU WILL: We need an overall pedagogy to address and include new standards, 21st century competencies, technology integration and more. PBL is the how to all of our whats. CAREER READY: We say this a lot, but we need to mean it. PBL allows choice and opportunities for students to explore, create and connect. When students are addressing real world problems, this will expose their thinking and experiences to potential career areas. Students need opportunities to get outside of the classroom and into the real world with their projects in order to begin thinking about the endless career possibilities. Indeed, PBL creates opportunities for all students to establish and expand their own Professional or Personal Learning Network. COLLABORATION: Students need real collaboration. PBL creates collaborative opportunities - not only with peers but with adult mentors, community members and professionals. Students need authentic ways of having professional and meaningful working relationships. The #1 reason people get fired is that they cannot get along with colleagues. So, we need to teach collaboration and partnerships to our students. ENGAGEMENT: We are always talking about this and struggling with engagement techniques, tips and tricks. That’s all fine and dandy, but what about having the work or curriculum be engaging? Since PBL is real, authentic work that provides student choice and voice, students have more reasons to be engaged. If one is involved and taking control of one’s learning more, one will be more engaged. Nothing is a panacea, but PBL offers lots of ways for students to be engaged. LIFELONG LEARNING - Again, this has been a tag line and a goal for a long time. But how do we do that? Well, if students begin to connect their learning to actual problem-solving and personal interests, they are laying the foundations of their life’s work, pursuits and learning. If students see their projects viewed, recognized and appreciated, they will also gain confidence and interest in going further, being more public and pursuing bigger/better projects. The bi-product will be a natural propensity for lifelong learning. PROBLEM-SOLVING: This another one of those terms that gets used constantly, but we often struggle with the how. Well, again PBL is the how. PBL is based on the core foundation of addressing or responding to real world challenges, issues and questions - i.e. problems. If we want our students to be problem solvers, let’s give them real world problems to solve. You have to learn by doing right? Also, a big bonus is that they might be the ones who actually come up with newer, better ways to address our many societal issues and challenges. Extra special bonus is that this is where the jobs are going to be as well. RELEVANCE: Students need to see a connection between their classes/coursework and the real world, their futures and their interests. PBL creates opportunities for relevance and continued connections. We need to create situations where student don’t come to school because they have to, but rather because they want to right? RESUME/PORTFOLIO: This is not a new idea either. However, think how most students leave our current K-12 systems with a transcript and not much else. PBL is public and automatically helps us create individual portfolios for our students. We present our projects and those presentations become part of student portfolios. Additionally, technology has created opportunities for all students to publish and be public with their work (social media, websites, YouTube and so much more). SKILL DEVELOPMENT: We are now very aware that students are in desperate needs of discrete skills for the new global economy. Much of these are often referred to as soft skills such as teamwork, communication, etc. PBL offers opportunities for students to develop skills in presentation, technology, research and more. THE FUN FACTOR: That’s right. We need to demonstrate and model that learning, as well as work, can be fun. Yes, this is related to engagement, but it’s more than that. Learning, school, work and the pursuit or answers/solutions/products should be FUN. When things are fun, we are not only more engaged, but we have higher brain function, physical benefits and more success. Our students need to be aiming for careers. Jobs are work, but careers can be fun. Our life’s work and learning should be and can be fun. If our students learn this, we might be giving them the best educational gift of all. ASSESSMENT: As a profession and a professional culture, we seem, to me, almost obsessed with assessment. We almost seem to let assessment, especially summative assessment, dictate the instruction or curriculum vs. the other way around. In PBL, yes assessment will generally be different. Teachers should like a greater emphasis on formative assessment and feedback. And since we have a greater focus now on performance tasks or assessments, we should embrace PBL. It’s all a performance assessment. Summative assessments, standardized assessments and others will exist. We have to conquer them all. But we can also begin to teach students that assessment is about improvement. We always say this, but PBL forces it. And since PBL correlates well with engagement, buy-in, and skill development, students can be set-up to perform just fine on all types of assessments. BEING PUBLIC: Just like our students, our work needs to be public too. We need to get feedback, but also have an urgency. You want transparency, well PBL does that. In PBL, students and their projects have to be public, so therefore educators’ work or products are now public too. Educators will need to embrace all opportunities to showcase and exhibit not only student work, but their work too. This will include, but is not limited to publishing, presenting, social media use and tech integration. CREATIVITY: This has been identified as a skill and focus area for our students. Indeed experts on the future of careers and jobs agree that our students’ ability to create and innovate will be key. Even though the projects in PBL will be student-lead and student-created, there is an essential need for PBL teachers to also be creative. They need to help create great questions and challenges. They need to create personalized and appropriate ways to assess their students’ work. They need to be creative in how they team students. They will need to creative in how many ways they can showcase and exhibit their students’ work. As students become more advanced, they will need to be challenged creatively with new problems, questions and issues to pursue. 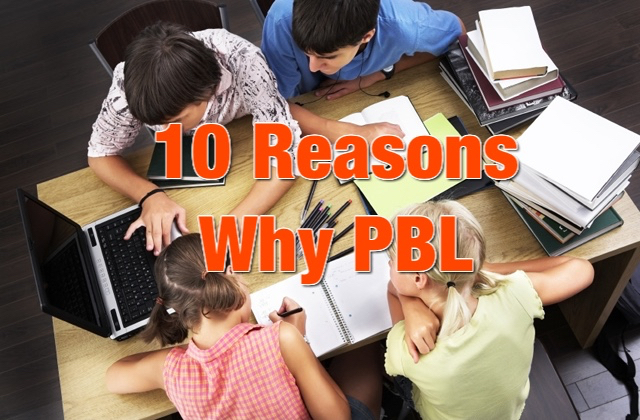 Educators will enjoy increased creative opportunities and skill development with PBL. CURRICULUM CURATION/DEVELOPMENT: For those that have associated their curriculum with a textbook, binder or other packaged curriculum, those days are gone in PBL. One has to be willing to research, collect, gather and curate from a variety of digital resources. Good news is that PBL requires students to do this too. So, essentially, all students become their own curriculum coordinators and curators. 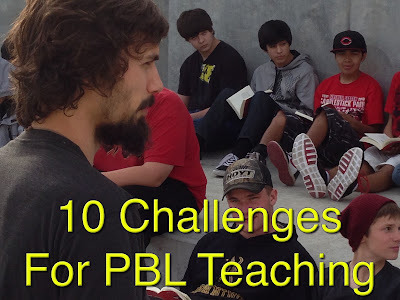 Since PBL is connected to real world challenges/problems, as well as personalized/customized response (students), then we cannot lean on a textbook or any other singular curriculum source. The rest of the world outside of schools use the internet for their curriculum, so we need to as well. MORE WORK: Is PBL more work? In some ways ‘yes’ and in some ways ‘no.’ It’s different for sure. But it will require teachers to be aware, open-minded, connected to their communities, collaborative with peers and partners, showcasing and exhibiting student work and more. It could be viewed as more work. For educators who are naturally active, engaged and connected, it shouldn’t be a lot more work. For those that are not, it could certainly be more work. If one is doing a pedagogy 360, then yes it will be more work. Our students should ultimately be working harder, but maybe not realizing it. PBL teaching moves faster, but because or more engagement, variety and buy-in, it could feel like less work. Working smarter? That’s PBL. OWNING THE LEARNING: If we want students to be engaged, think critically and have buy-in, we have to transfer the ownership of the learning. This is not easy or automatic. For those of us that have taught in elective areas or project-based environments, this might be easier or more familiar. And many of us have done this from day one. We’ve heard lots of sayings such as not being the “sage on the stage” but rather “the guide on the side.” The teacher’s role in PBL is very active and more important than ever. However, it is more of a facilitator, project manager and project coordinator. Teachers will have to create a place where it’s not “my classroom” but rather “our classroom.” If we want students to own their learning, as well as their lives and futures, we have to be able to transfer ownership. Control only produces compliance. Relinquish control and set the learner free. Again, teachers are hugely important more than ever. But our role will be different than traditional teaching. SUPPORT: Nothing will truly transpire or transform in education without tremendous leadership supplying vision, confidence, fearlessness, innovation - support. PBL asks students, as well as teachers, to take risks and not be afraid to fail. Our leaders have to model that. Some educators will naturally have that level of confidence in the classroom to make PBL flourish without the leadership and support - as there are those crazy maverick-like teachers. But that’s not enough right? The system, lead and modeled by the leader, has to support PBL practices. TRUE COLLABORATION: Collaboration is one of the biggest buzzwords. We have PLC’s, SLC’s, PLN’s, Teams, Groups, Collaboratives and so much more. Of course, educators need to collaborate. And not just with their colleagues and peers, but with community members, professionals, and job-alike folks from around the world. Our students are going to need to do this and we have to model it. But educators have traditionally worked in isolated classrooms with isolated curriculum. Yes, it has changed some and has gotten better. Technology has really made this possible. But PBL will push this further than ever. Educators will have to collaborate with people outside of education. This will involve learning and not all educators will embrace this. But, like antibiotics, it will be good for them. TRUST & BELIEF IN STUDENTS: PBL requires a core belief that students can do professional, meaningful authentic work on and off their campuses. It requires educators to sincerely believe that all students can and will have issues / challenges / problems / questions that they are passionate about and connected to - maybe beyond us. Can students work collaboratively, independently, differently and not in the continuous control of the teacher? Of course they can, but some will struggle to live this way. If we are attached to desks in rows, quiet students, low level homework and robot teaching, PBL will test us. We have to trust and believe that students have good ideas, natural interests, and do want to succeed. We have to believe in empowerment and transformation vs. compliance and control. We have to trust and believe that each generation of young people can be better, not worse than the one before. VARYING EXCUSES: Just like students, us adults will find infinite ways to often get out of something. We are all artists at creating what seem to be rational or logical reasons why something can’t work. We’re predisposed, if you will, to do this. I think it’s a defense mechanism biologically to survive. This comes from fear. What’s different, strange or new is not always viewed as potential learning. Rather, they are roadblocks that we manufacture. And our system supports these - whether it’s related to time, money, unions, job descriptions, assessment, tenure or so many others. If we are afraid, and afraid to truly fail forward, we won’t have the spine or heart for PBL. Real work and real learning are about the unknown and we have to enter in fearlessly. Change is difficult, but required for higher level forms of learning. PBL embraces change and works to eliminate excuses. PBL’S time has come. All of the goals in 21st century learning are addressed with project-based learning. It is the pedagogy that models what real work and life experiences are about. Education has a tremendous opportunity, more than ever, to embrace and maximize PBL. But like all great changes and advances, our mindsets as educators will have to evolve too. We can do this. Our students deserve nothing less.